Those close to the sport have a hard time explaining what drives hobby racers. The risk of personal injury and vehicle damage outweighs potential winnings. But racers enjoy other rewards, says Mark Tassler, Promotions Director and Track Announcer at Huset’s Speedway, a dirt track in Brandon, S.D. Love of speed. Competition. Comraderie. Mechanical know-how. Family history. Those are all factors, Tassler and other racing enthusiasts say. And it seems natural that those who spend their days making fuel also spend their free time using it. 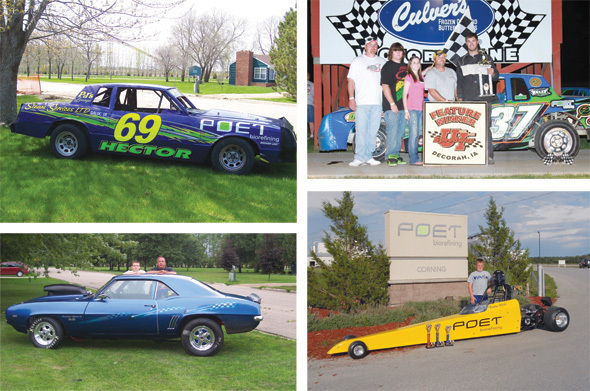 POET team members are well represented in racing, from go-karts and dirt bikes to dragsters and stock cars. Here’s a glimpse of a few team members who participate. Although only 22, Mike Pace has achieved considerable success in kart racing. Pace, Custodian at POET Biorefining in Fostoria, Ohio, has 396 feature wins and 12 track championships. His grandfather and father were involved in racing, and he started getting involved at age 4. His father, Jim Pace, is his crew chief, and his fiancée, Sarah Wagner, accompanies him to the track. His home track is Lil’ Indy Kart Racing in Carrothers, Ohio, but he travels to other tracks as well. Go-karts will go 30 to 50 miles an hour on small tracks, and from 80 to 120 on large tracks, he says. “When you’re going 120 in one of those, it’s pretty out of the world because you’re so close to the ground,” Pace says. Jeremy Wall, a Boiler Operator at POET Biorefining in Bingham Lake, Minn., rode a 50cc dirt bike for the first time at 4, with help from his father. “It’s kind of like riding a bicycle, just a little faster,” he says. Now 24, he drives a 250cc Kawasaki and is enjoying his second season of racing. He’s raced about 20 times this season on tracks in Minnesota, Wisconsin and Iowa, and leads his class. He loves the competition, despite a couple accidents, including one last year in which he broke his ankle, he says. He’s already given his 3-year-old son a taste of dirt biking. “He runs the controls, and I balance it for him.” Wall says. Scott Hector, Maintenance Manager at POET Biorefining in Bingham Lake, Minn., raced hobby stocks for about a decade. He was a track champion at Nobles County Speedway in Worthington, Minn. This year, he started drag racing his 1969 Camaro at Thunder Valley Dragway, a hard-surfaced, straight track in Marion, S.D. “I never dreamed it was going to be like it is. It’s been a lot of fun,” Hector says. Brad White, Lead Operator at Poet Biorefining in Corning, Iowa, helps his 9-year-old son, Keaton, race half-scale dragsters at the Mid America Motorplex in Pacific Junction, Iowa. The elder White enjoyed driving race cars in the past, but he finds tuning his son’s dragster to be a bigger thrill. The dragster can reach about 55 on an eighth-mile straight track. “He sits low to the ground. I’m sure it seems faster,” White says. Even if he wasn’t driving a race car, he’d still be at the track helping friends, Pete Solum says. Solum, Commodities Supervisor at POET Biorefining in Preston, Minn., races weekly in the stock car division at the Upper Iowa Speedway in Decorah, Iowa. He’s fifth in the standing. He’s 24 and has been involved in racing since he was 16. He’s assisted by his father, Ed, as well as a friend and a cousin. The crew built his current car from the frame of a mid-1980s Oldsmobile Cutlass. “A lot of close friends of mine, I met through racing. It’s kind of what we do,” he says. Kyle Purvis says his mother gets edgy watching him race his modified stock car on the hard-surfaced Columbus Motor Speedway in Ohio. “She gets nervous because there are wrecks,” he says of Kathy Purvis, Accounting Assistant at POET Biorefining in Marion, Ohio. The younger Purvis, 24, helps manage a 3,500-acre farm that sells corn to POET. His father and a buddy serve as his crew. He is third in points in his division so far this season. “Just about anybody, in any age group, can get into circle track racing,” Kyle Purvis says. Ron Gough, Maintenance Manager at POET Biorefining in Laddonia, Mo., has a successful past in racing. He hopes he has a successful future, too. He won three Illinois state titles in karting and four track championships in Missouri before taking a break from the sport. The 40-year-old even met his wife, Brenna, at a race track. Now he is building a new car with plans to get back into racing next year.